Matudnila.com - A Cebu Events Blog: NOKIA Top Download Application & Games in 2011 revealed. Home Symbian App NOKIA Top Download Application & Games in 2011 revealed. NOKIA Top Download Application & Games in 2011 revealed. NOKIA's Top Downloaded Apps and Games from Nokia Store for 2011 reveals Filipinos have gone completely social as Filipinos shares and connects more with their friends and companions based on the significant number of Chat and Messenger Apps. Game applications also tops the list most downloaded apps and games of Nokia Store for 2011. Mobile Games developed by Filipinos who received significant hits from downloaders who find their content fun, easy and related to their taste. Mobile Games in Nokia Store like a simple puzzle game or action-packed racing games. Nokia Store App and Games download reaches to 46 million Global Application downloads. Nokia New GM. Nokia, New GM in the Philippines Dharmesh Goshalia. 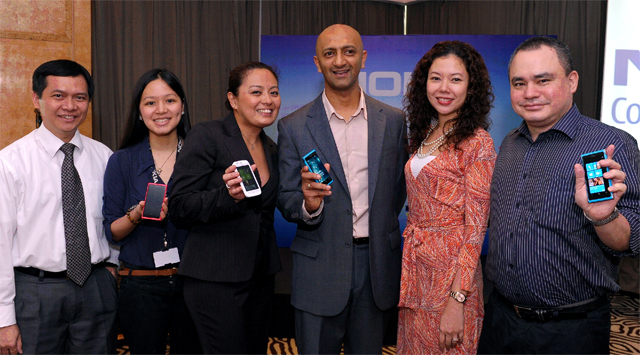 Photo shows Goshalia (center left) together with Nokia executives (from left): Head for Ecosystem and Developer Experience Rhomel Marcojos, Marketing Manager Jonica Peña, Retail and Customer Marketing Manager Cristina Trinidad, Corporate Communications Manager Nikka Abes, and Device Portfolio Manager Mike Smith. Complete list of the most downloaded Free Apps from Nokia Store in the country. Facebook Chat – For those who just can’t get enough of Facebook, Facebook Chat feeds your hunger for social networking by allowing you to catch up with your friends easily even on the go. Chat for Facebook Pro – This is the only application for chat on Facebook for mobile phones that allows you to connect with your contacts no matter which carrier you are using. Chat for Facebook Pro also shows all your friends’ profile pictures and sound notifications, and is even faster than when you chat on PC. Skype – Skype lets Nokia users keep in touch with the people in their lives by offering free Skype to Skype calls (voice and video) over Wi-Fi as well as messenger style chat and low costs international calls. Adventure of Ted – This game app lets you jump, run, and kick your enemies out of your way. Save Ted from enemies and help him to get to his home in this cute game. eBuddy Mobile Messenger – With over 100 million downloads to date, this is hands down the most popular free chat app today. It lets you chat on MSN, Facebook, Yahoo!, GTalk, AIM, MySpace and ICQ, and allows you to send pictures, set your display picture from your phone camera, choose colorful themes, and much more! Snaptu – This app helps you make the most of your device by keeping everything you need in one place. It includes mobile essentials such as Twitter, Facebook, Flickr, Picasa, News, Weather, Sports, Movies, Sodoku and more. Dictionary & Translation Pro – This offers easy one-touch access to an extensive online English dictionary, thesaurus, and translation service supporting a wide set of languages including Hindi, Arabic, French, German, Spanish, Italian, and many more. High Speed 3D Free – This top downloaded app allows you to take to the streets in High Speed 3D, racing on 20 tracks in 9 different cars. Enjoy the insane drifts and nitrous boosts of this action-packed racing game! Hangman – Discover new words, develop your vocabulary, and have lots fun with this game app. Bubble Popper XXL – This free game allows you to compete with your Facebook friends for bubble-popping supremacy. Top 5 paid Game Apps From Filipino Developers for 2011. The Tallest Ice Cream – The object of this fun and addicting game is to create the tallest ice cream. The taller your ice cream becomes, the faster the scoop moves. Pharaoh’s Tomb – This game lets you embark on a quest through a magical maze, collect as many score points as you can and find the exit – all while avoiding the traps and pitfalls along the way. Tong-its Extreme – The improved version of the highly rated “World Tong-its Tour” game, it allows you to take on multiple personalities that use different AI engines. Enjoy unlimited chips to beat the AIs, and battle your way to the top of the World Tong-its Chip Leaders server screen. Pinball ME – This arcade game features nice graphics, real pinball sounds and addictive gameplay. Nice Fruits – A casual game where you must collect three or more of a kind of fruit. It features nice music and sound effects, stunning graphics and high replay value. Rhomel Marcojos, senior marketing services manager of Nokia Philippines says “The number of downloads garnered by social networking sites, chat, video chat and messenger applications reflects just how important it is for Filipino mobile users to be always online and connected with the people who matter most to them." To download applications for your Nokia smartphone, simply visit the Nokia Store at http://www.store.ovi.com/. 0 comments: on "NOKIA Top Download Application & Games in 2011 revealed."